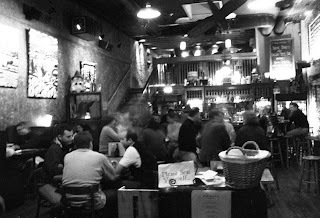 One of the boys' favorite places to go out is Brick Store Pub in Decatur. Give them a boys night, and they are all there. The huge beer selection is obviously the huge draw. They have a special Belgian Beer Bar upstairs, and then a regular one downstairs, and both have 10-20 beers on draft. But in addition to that, they probably have another few hundred beers in bottles from all over the world. Their selection is insane. Honestly though, as much of a boys' hangout as Brick Store can be, its one of my favorites too! I have become a bit of a beer enthusiast over the years, and love trying out new ones. Granted, I usually stick in the Sweetwater 420-type pale and amber ales, but on occasion I will try out a new one, like a perfect-for-fall Octoberfest, or the lighter summer-y Hefe Weizens. If you don't know a thing about beer but want to try something other than your usual Sam Adams, tell your waiter what things you like and they can help you pick something out to try. If you really could care less about beer, go to try out their pub menu. I LOVE the chicken salad melt - its perfect on a crisp fall day. But then they have other awesome things like Bavarian pretzels, bratwursts, and Shepard's Pie. This is pub food, but gourmet style. Definitely a step up from the usual fare. Go early if you want to sit down at a table right away, or cram in at the bar to eat or drink if you get there later at night. Why is Buckhead Betty posting about this place though? While Brick Store doesn't flaunt especially low priced food or drink, you can go here and feel like you just traveled around the world to an old-world style bar in Europe. Try out a new type of food or drink, enjoy the all-wood decor, and relax on your faux vacation. Do you have a favorite beer or menu item at Brick Store? Let me know in a comment! I love the St. Bernardus Abt. 12! Definitely the best beer to get the first time! I'm a big fan of the Brunswick Stew and the Brick Burger with blue cheese (plus an appropriately paired beer, of course!) That's one of the things I like best about The Brick Store ... all the folks working there are as big a beer geek as am I and have always knocked it out of the park when I ask them to recommend a pairing. David - I love that too, they always know something good to recommend no matter my mood, the meal, or the season. Thanks for the post!